Here's the oldest building on SPI, as was written up by Rod Bates in his latest History to the Point column. 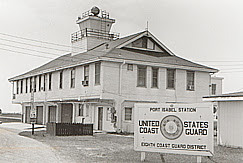 The old Coast Guard building is thought to have been built in 1924 or maybe even before that. Excellent article if you want to stop by at that link. On Wednesday our SPI Historical Committee had a presentation by the Texas Historical Commission, which was quite informative but after a while seemed to boil down to preserving old structures. That's a bummer because except for this beauty captured in the file photo above, "we ain't got none." To be considered truly historic, a building must be at least 50 years old. I don't think there's much on the Island that predates 1957. But that's not going to stop us, since our community is all about people, not stinky old buildings. It is about people with names such as Balli, Tompkins, Shary, Stillman, Singer, Ila, Captain Jim, and Boomerang Billy. There are a ton of old photographs, and Jason Yetter even had a good idea to look into statues of maybe a few (we hatched this idea after the meeting). Steve Hathcock even had a great idea for a fold-out historical map. Anyway, it is good to see that things historical are picking back up.